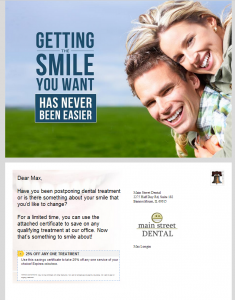 To be a successful, modern dental practice one has to market outside of the waiting room. While your front-of-the-house team can help you score referrals and keep your active patients happy, you’ve also got to be thinking about the patients you haven’t seen in a while; the ones you never see; and those whose health or appearance would benefit from your friendly nudge. To get to them, forward-thinking practice leaders plan and execute a schedule of marketing campaigns that help them stay front-and-center. 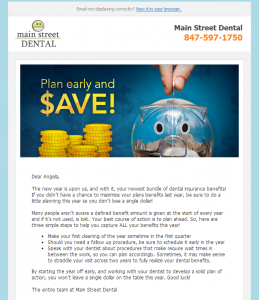 With that in mind, here are eight great campaigns you can use this month to warm up your patient base and your end of year production at the same time. 1. End of the year insurance/FSA reminders – a better way? Is your office staff burning up the phone lines calling patient after patient to remind them about their soon-to-expire insurance benefits? Have you ever calculated the return on that investment of time? A better way to do it may be to use an email or direct mail campaign. You can also use this message to nudge them to schedule any pending treatment – or to get in for a preventative appointment in case something is “wrong” and they just don’t know it. All it takes is sending them a quick “use it or lose it” campaign to give them a heads-up. One way to avoid the rush to get people in the door at the end of the year is to remind them to spend wisely at the beginning of the year. Since many people aren’t even aware that a defined benefit amount is given at the start of the year and lost if not used, your best course of action can be to remind them to plan ahead. 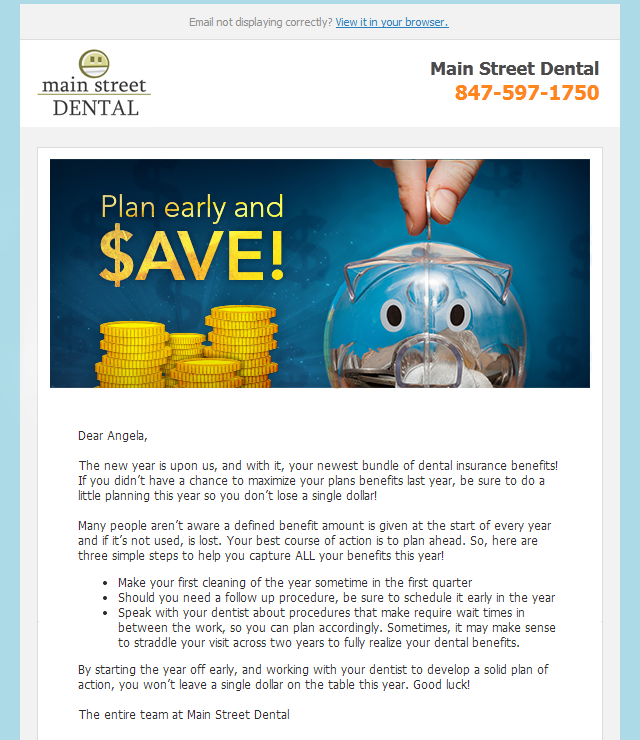 How about a mailer that suggests they have their first cleaning of the year in the first quarter instead of waiting? This way, any follow-up treatment can be planned with time and money to spare. By starting the year off early, your patients will better manage their insurance benefits, and your office won’t be swimming in tons of last minute exams and paperwork at the close of the year. For many of your patients, life gets in the way of good dental care. Whether it’s work, parental obligations, or just plain forgetfulness, following through on a recommended dental procedure is often at the bottom of the priority list. That said, a well-placed reminder about the importance of completing their treatment plan can do the trick. Remind them of the concern you have for their health without using scare tactics, and if you include a note about expiring insurance benefits, you’ll dramatically increase your chances of getting the patient back in the door sooner rather than later. 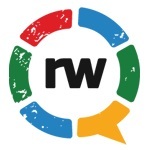 Every business owner understands the tremendous cost involved in acquiring a customer. So when that customer (or, patient in your case) seems to disappear from the face of the earth, you need to find out what happened. Give them a call, or send a series of emails combined with calls until you understand why you haven’t seen them. These efforts do pay off and are worth your time. 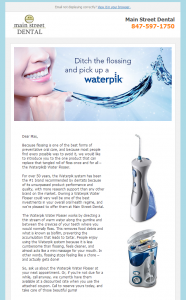 Help your patients understand that you care, and that you would like to see them again. Sometimes just a friendly reminder will be all it takes to get a patient in your office and back on track with their oral health. Do you know why most people wait till the last minute to do their holiday shopping? Because they hate it. Seriously! Most folks have no idea what to get anyone, and the idea of spending hours in a mall, shoulder-to-shoulder with the masses, is about as fun as sitting in your chair for a root canal. So, why not seize upon this knowledge and suggest a few things from your own office? Send out a campaign mentioning a single product if you have a lot of stock lying around, or send out a message that suggests a few different options. Don’t forget people may want to buy the products for themselves as well. For example, most people wouldn’t want to be given a breath freshening kit as a gift, but they might get one for themselves. Once you try a product campaign like this and experience some success, you just might get hooked on the idea and start ordering more products than you dreamed possible. 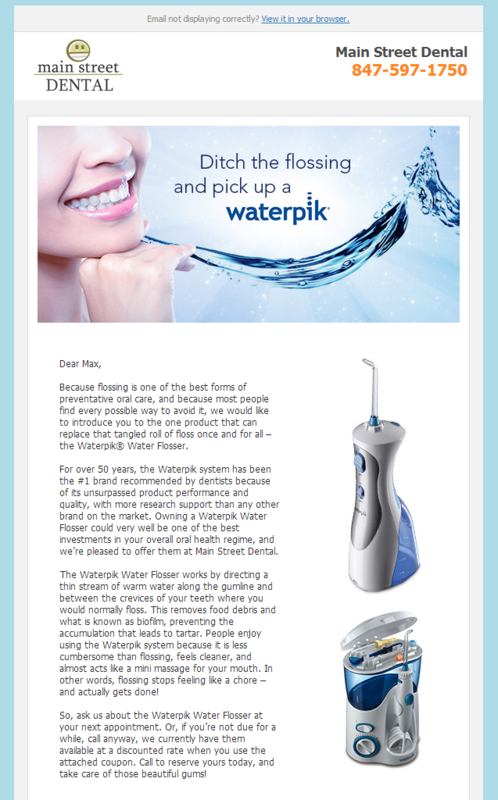 Dental product manufacturers are still in business because people buy their stuff. Would you rather have your patients buy from you, or the local big-mart store? How would you like to put an additional $16,390 worth of production on the books before the close of the year? 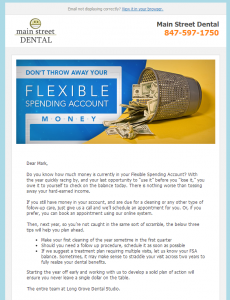 A few weeks ago I received an unsolicited letter from an office manager who helped generate exactly that dollar amount after sending out a single email campaign offering 25% off any one treatment. Of the 421 patients she sent the email to, 167 opened the message, and 24 scheduled treatment.Now that’s the power of a good offer. Put on your holiday hat and test out a discount offer. Not sure we’re right on this? There is a reason AOL sent all of those CD-ROMs to your door in the ’90s and why Bed Bath & Beyond sends out tons of their big blue 20% Off direct mail pieces – because they work. Try one! You might be pleasantly surprised with the results. Too early? Never. People are always thinking about how they’re going to improve themselves in the coming year. And since December is crunch-time for deciding on something, an elective procedure campaign can come at just the right moment. For this sort of campaign, think about the things people tend to wish for. Generally speaking, the number one resolution for everyone on the planet is to lose weight, and right smack in the middle of the typical top ten is to be, or stay, fit and healthy. People are wishing to look and feel better. With that in mind, you could consider campaigns for teeth whitening, orthodontics, cosmetic veneers, or even a full smile makeover. We all know that holiday cards already overflow our mailboxes and inboxes, so why should you send one? Does anyone really care? You bet they do. People notice these cards, and they most certainly notice when you don’t send one if they received one from every other doctor or service provider they deal with regularly. So, fire up those postcards. Spice yours up by including an offer of some sort, or a reminder about any of the above campaign ideas. The point is that you’ve got to send something to remain top of mind for each of your patients and stay in their good graces this holiday season. 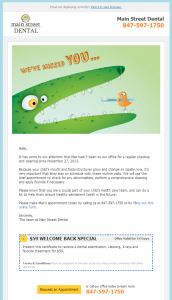 Creating a proactive marketing approach can be easy, fun, and rewarding for your entire team. All it takes is a little bit of brainstorming and the effort to put that plan into action. Thankfully, with technology like RevenueWell this is all so much easier than in years past. Now all you really have to do is just commit to getting it done! 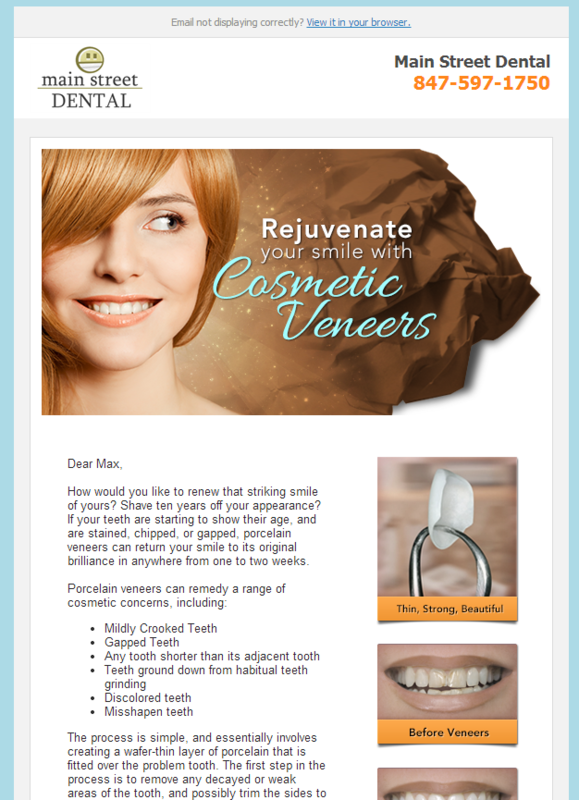 These are great ideas, and with a little tweaking towards our ortho patients, we can incorporate them into our email marketing campaigns. Thanks for sharing, would be interested in more of these ideas to use throughout the year.